Welcome to the Green Hotel! 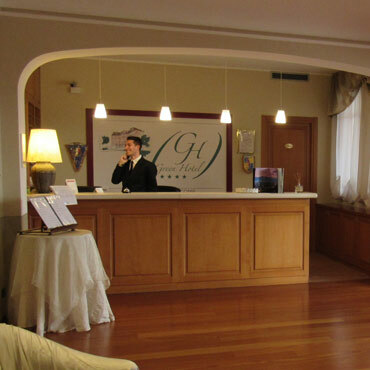 The Green Hotel in Settimo Torinese is a modern 4-Star hotel with 41 rooms, completely renewed in 2017. It is a fine welcoming house provided with all comforts. A strategic position: 15 min. away from Torino Juventus Stadium, close to the main highways, just twenty minutes by car from Turin International Airport, fifteen minutes from the prestigious Royal Palace Reggia di Venaria. The Green Hotel is a perfect location for a pleasant stay for business and leisure guests. The best expression of comfort and welcome is given by our 41 fully equipped Rooms: a relaxing and charming ambience with hairdryer, minibar, TV with Sky channels, Free WI-FI Ultra Speed internet connection, safe box and air-conditioning. A fully equipped Fitness Centre allows you to relax after a stressful day, waiting to taste the typical regional dishes at the "Primos Restaurant" our pride, open for dinner from 7.30 pm to 10.15 pm. A rich and generous breakfast buffet will be waiting for you from 6.30 to 10 am. It is served in the hotel's spacious dining room, which is flooded with natural light. In the buffet you'll find eggs with bacon, cheese and salami, sausages, boiled eggs and cheese, assorted yogurts, cereals, fresh fruit, juices etc..
For your Meetings, a modular room up to 90 people, with Ultra speed Wifi internet connection, equipped with modern technologies: a giant screen, video projector, flip chart, DVD player, microphones and audio amplification. Our staff will assure a great attention for your successfull business meeting Free private parking is available for our guests. A rich buffet for a pleasant awakening.